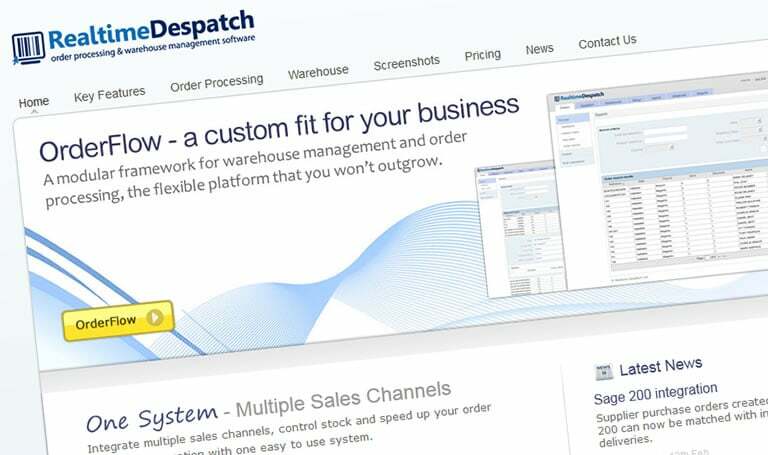 Today Realtime Despatchs‘ new website went live! We’ve been working on the web design and build of their new website for a while – we can now finally say ‘Hurrah!’ as the site officially goes live! We initially started with the project a total re-branding of their existing corporate ID, modernising the whole feel of the company and enforcing them as market leaders with what is an extremely high quality product. Once the branding was finalised the web design project started with an in-depth content, wire-frame and grey-scale layout process. As Realtime’s web based application targets three distinct markets (E-Tailers, Fulfilment Houses & Web Developers) – our (not so easy) task was to deliver the applications general benefits together with highly targeted content unique to each different user base. All without turning away any of the 3 user bases or looking cramped. Our grey-scale design process helps immensely with finding the optimum way to display the content of the website, so both the copy and layout deliver the right information at the right time and in the right place. Our solution was to combine a generic header with a tabbed based user-focussed sub-header – giving each user base a quick overview as well as quick and easy access to specific and key area of interest. Once the copy, content and layout had been agreed we were tasked with final design process, implementing colours and branding throughout. Then onto a standards compliant (including the dreaded and ‘dead’ IE6!) HTML & CSS build. Unusually the client opted out of a full Content Management System (CMS) build. For ease of use however we also helped build the structure of the site with PHP, making it all as modular as possible. Charlie and Phil over at RD where great to work with and we’re delighted that they’ve now tasked us with helping them with the User Interface Design (UI) of the main application itself. ← My kingdom for an update!